The case of a large pig allowed to fly with a passenger illustrates a loophole regarding so-called "service animals" that could compromise aircraft cabin safety. At the very least, cabin sanitation was not maintained as the squealing animal urinated and defecated in the galley during the frenzied effort to get it off the airplane after landing. Had the airplane encountered turbulence, a startled, frantic pig could have posed a serious safety hazard. 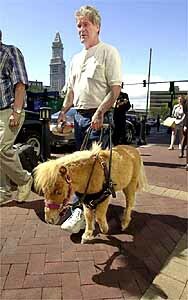 While most people are familiar with "seeing eye dogs," service animals can include pigs and miniature horses. For example, last week Delta Airlines [DAL] accommodated a blind passenger, who was accompanied by "Cuddles," a 50-lb. 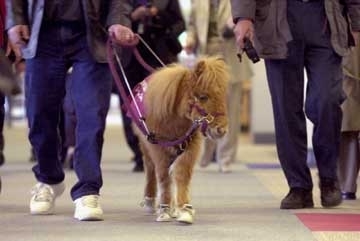 miniature horse, on a flight from Atlanta, Ga., to Raleigh, N.C. The day before Cuddles' flight, a carrier official quipped, "Let's hope it's not 'puddles.' "
In a flight last November from Philadelphia to Seattle, US Airways [U] allowed a woman to be accompanied by a pot-bellied pig. 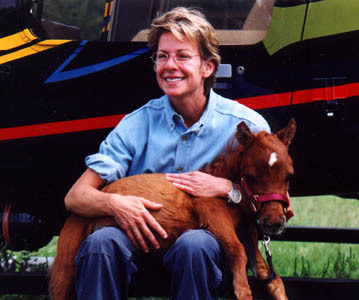 In arranging for her flight well beforehand, she had requested that the carrier grant approval for the pig to accompany her in the cabin as an assist or service animal (the terms "assist" and "service animal" appear to be used interchangeably in the numerous documents reviewed for this story). Typically, such animals are defined as any guide dog or other animal "individually trained to work or perform tasks for an individual with a disability." These tasks include the well-known "seeing eye" function performed by dogs for guiding individuals with impaired vision. Service animals do not have to be "certified," per se, and indeed carriers may not insist on any "proof" of certification under the provisions of the 1986 Air Carriers Access Act and of the 1990 Americans With Disabilities Act (ADA). However, they cannot simply be pets. Under the ADA, all service animals (not just guide dogs) must be allowed access to public facilities and transportation vehicles, violation of which is a misdemeanor. However, they may not occupy seats. US Airways appears to have made a good faith effort to accommodate the passenger and her pig. According to internal carrier documents obtained by this publication under the Freedom of Information Act, the passenger advised carrier officials that her pig weighed some 100 pounds. She also presented a physician's note; although the note was not released under FOIA's privacy exemption, it can be inferred from the carrier's internal correspondence on the matter that the doctor alluded to the pig's calming effect on the woman, who apparently had a heart condition. The carrier's legal and consumer affairs departments reviewed and approved the passenger's request. In addition, extra bag charges were waived and the economy-class ticket was upgraded to first class. The 24-inch by 52-inch area just aft of a bulkhead in the first-class section of the B757 allowed more room for the passenger, her travelling companion - and the pig - to travel comfortably. On the day of boarding, the gate agent declared, "I was taken aback at the size of this animal." The surprised agent surmised that the "true size and weight of the pig were not accurately conveyed to the company when the prior arrangements were being made." "I initially was going to deny boarding but due to the decision being made at the corporate level, I allowed the transaction to be processed," the agent said. Although the two women and their pig had been assigned the most spacious seats at the bulkhead, the pig was so large they were forced to make the entire flight with their feet placed on the bulkhead. The incident was the subject of numerous jibes. "We had to listen to jokes and slurs for six hours," recounted flight attendant Sharon Krug. In an e-mail titled "And I thought I'd heard it all..." another US Airways official said: "The flight departed with the pig wrapped in a blanket. I recall the International House of Pancakes had a great breakfast called '3 Pigs in a Blanket.' It was sausages wrapped in pancakes, but I never got one that weighed 300 pounds!" Calm throughout the flight (possibly sedated, one witness suggested) the pig apparently became frantic during deplaning. "It cornered a flight attendant and made a terrible noise that rang through the cabin," recalled flight attendant Tonya Parrish. "It was apparent the pig was not a trained assist animal," she said. Flight attendant Leslie Savage recalled, "When it came time to deplane ... the owner of the pig had no control of the animal. She had to get on the seat to shake and scream at the animal." "If this was a service animal, I can't tell you who the pig was there to help," she asked. "This approach will allow for discussion and establishing expectations rather than outright telling her we won't provide transportation. In this conversation we will learn from her whether she intends to travel with the pig on the return, of if there are alternative arrangements we can make not only for the pig but for her disability...our objective is not to transport the pig, but also not (to) create a bad situation with the customer, since we did allow the pig to travel to SEA (Seattle)." The paper trail ends at this delicate juncture. However, the return ticket was not exercised, mercifully sparing US Airways officials from having to confront the woman. 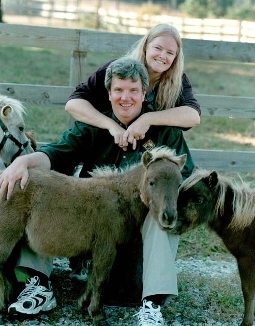 The pig flown by US Airways was considerably larger than "Cuddles," the miniature horse that flew March 6 on a Delta B757, marking the first commercial flight for a guide horse. As in the saga of the US Airways "flying pig," Cuddles shared space in the bulkhead row, but in row 20 of the coach section, not in first class. 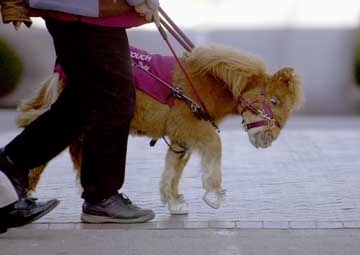 Because a horse is physically restricted from curling itself into a ball like a dog, the airline requires disabled passengers with guide horses to purchase two seats in order for the horse to have sufficient space to settle down on the cabin floor. 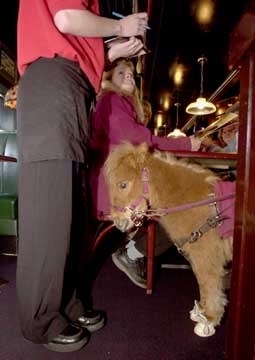 Further, because a horse does not rise as quickly as a dog, one of the two seats must be next to the window (thereby placing the horse farther from the aisle). For reasons of safety, the Federal Aviation Administration (FAA) has determined that service animals cannot obstruct aisles. Nor, with the exception of monkeys trained as service animals, can they occupy seats. For mobility-impaired passengers travelling with monkeys, the FAA has declared that these animals should be treated the same as lap children: "A disabled passenger should be able to accommodate a monkey of roughly the same size as a human infant in the same way." The FAA has also decreed that the "under the seat" requirement needs to be "interpreted reasonably." Many guide dogs, along the size of a German shepherd, clearly would not fit in such a small space. The FAA maintains that if the animal extends into the area where the passenger's feet would be placed, that does not constitute grounds for determining that the animal "should not be accommodated at the passenger's seat." Unless, that is, "the carrier so strictly enforces its carry-on policies that it requires other passengers to move their carry-on items if any part of an item extends into that area." One assumes here that this last "item" refers to the service animal. The extant guidance seems ripe for abuse, as was evidenced in the case of the 300-lb. flying pig. US Airways flight attendant Kenneth Pike raised the issue of the pig's presence in the event of unexpected clear-air turbulence. The pig posed a significantly greater potential hazard than an unsecured service cart in the aisle. Or, sufficiently startled by turbulence, it could have attempted to bull its way into the cockpit. Sedating the animal before flight would clearly negate the "service" function these assist animals are trained to provide. And, during a potential emergency evacuation, there may be cases where a trained service animal is less prone to panic than people. Nevertheless, a number of safety issues appear relevant. In the event of an emergency, passengers accompanied by service animals so large they must place their feet on the bulkhead cannot assume a correct "brace" position. 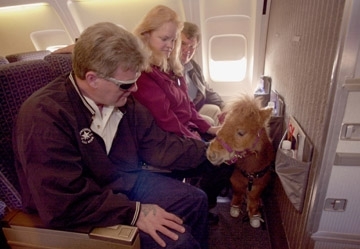 Very large service animals also present an unsecured hazard in the event of turbulence. A large alarmed pig on the rampage places cabin staff, other passengers, and potentially the cockpit crew at risk. The squeals of a terrified pig will almost certainly unnerve passengers unfamiliar with the sound, thereby increasing the anxiety level in the cabin. Leaving the determination to the captain as to whether or not a large service animal constitutes a potential hazard could be viewed as avoiding these issues. At the very least, deferring such decisions to captains may be a prescription for inconsistent "policy." One captain's safety hazard could well be little more than a curiosity to another. Dumping the problem on the captains also seems unfair; the captain's role is not one of making ad hoc policy, but rather one of being responsible for safe operation of the airplane in accordance with approved, standardized procedures. Despite its initial somber statements about potential safety and enforcement issues, the FAA ultimately determined that US Airways acted appropriately. The regulations don't say pigs can't fly in the cabin as service animals, therefore no violation was committed (although in this case the pig falls suspiciously into the "therapy animal" category, which is not permitted in the cabin). The regulations on service animals, however, do not appear to set any sort of an upper limit on the weight or size of a service animal. Guide dogs for persons who have visual impairments. Hearing and signal animals (e.g., dogs, cats, monkeys, pigs) for persons who have physical disabilities. 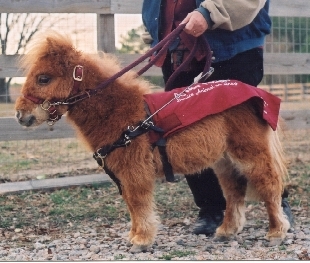 Animals for persons with physical disabilities (e.g., dogs, cats, monkeys, pigs). Seizure-response/alert animals (e.g., dogs, cats, birds) who alert individuals with seizure disorders to on oncoming seizure. 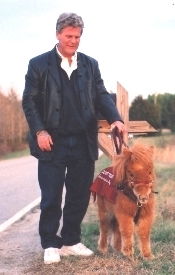 Emotional support animals (e.g., dogs, cats) who assist persons with severe emotional or mental disabilities (e.g., autism). In contrast, therapy animals.... not specifically trained to perform a function for a particular person, are not considered service animals (and) would not be afforded access rights under ADA (the Americans With Disabilities Act). Monkeys are sometimes used as service animals (and) are taught to perform many of the same functions as service dogs, such as retrieving dropped items...a bus system in Florida reports that it has a passenger who travels with a monkey, who deposits the fare into the farebox. As with service dogs, a monkey should have a harness of leash so that it is under the control of its handler at all times. Pigs are very smart are sometimes used as service animals. Pot bellied pigs are small and favored as service animals by persons who are allergic to dogs. The New York City Transit Authority has passenger who travels as a service pig. Source: Assisting Passengers Traveling with Service Animals, by Rosemary Mathias, Center for Urban Transportation Research, Univ. of South Florida, January 1997. "This investigation concluded USAA (US Airways) and their personnel acted in a reasonable, thoughtful manner based on a legitimate request to transport a qualified individual with a disability and her service animal. The FARs (Federal Aviation Regulations) are essentially silent on this matter. Accordingly, we find no violation of the 14 CFR parts under consideration and consider the matter closed." "I was the 'F' flight attendant on this flight; therefore I was at the boarding door. Prior to boarding an agent supervisor came down and asked for the 'A' flight attendant. He informed her, in front of me, that we were about to encounter an unusual situation and he wanted us to be ready for it." "He went on to explain that we would be transporting an assist animal and that it had been cleared through the legal department and ticket counter. That is when he told us it was a PIG!!! (Emphasis in original). He also told us that it weighed less than 100 lbs. and that it would be riding in the first class cabin." "...They waited until last to board. By this time, everyone in the boarding area knew about it and we heard lots of comments. When they finally came to the plane, it wasn't the passenger or her travelling companion that brought the pig on. Another woman and a man brought this HUGE pig on board, almost knocking over the first class passengers that were still putting their bags up. One of the women said in a very loud voice, 'You people need to clear the area so we can get this animal on here.'" "The pig was NOT less that 100 pounds. It was at least 250-300 pounds. It pooped in the jetway and the pig handlers never made an attempt to clean it up. There were pig turds right outside the airplane door. The pig handlers then left the plane after getting it settled down on the floor at the bulkhead seats 1A and 1C. Now, I ask you, if this were an assist animal, shouldn't it have been assisting the woman rather than being brought on by two people that weren't even going on the flight?" "The only time I even saw the pig during the flight was when I went to the cockpit. The pig was lying on a blanket, on the floor (taking up the entire space). It took up so much Space that the women placed their feet on the bulkhead wall. The pig also was covered with a blanket so you couldn't really see it." "When we arrived in Seattle and everyone else had deplaned, I walked up from the back...and witnessed these two women struggling with the pig - trying to get it off the plane. The pig was squealing loudly and appeared to becoming agitated. The older woman pulled on the leash while the younger woman pushed from behind. Again I ask, how could this (pig) be of any assistance to her when she couldn't even control it?" "We all walked up the jetway to the boarding area, where the pig stopped and urinated on the carpet. The women looked at it (and) walked away saying, 'Oh, someone will clean that up.' The pig was still squealing and everyone in the boarding area was looking at it, some even taking pictures. The crew waiting for us to deplane were shocked, to say the least." "Now, to just a few comments/observations:"
"I want to make it perfectly clear that as the flight attendants on this flight, we were told that it was cleared through the legal department and that we had to accept this animal as an assist animal. It wasn't until we were in-flight that a passenger in the last row told us she had been talking to the ladies in the boarding area and was told by them that they were transporting this animal to its owner in Seattle. If the situation were to ever arise again, I would walk off the plane. If we had hit turbulence, there was no way to contain this 300-lb pig that could have seriously hurt someone." "I am so tired of hearing/talking about this flight. We (US Airways) are the laughing stock of the industry right now. I'm very embarrassed about this and hate to even admit I was part of the working crew." The best nightlife in kiev.